Earn $0.84 in Rewards credit (84 points) What's This? 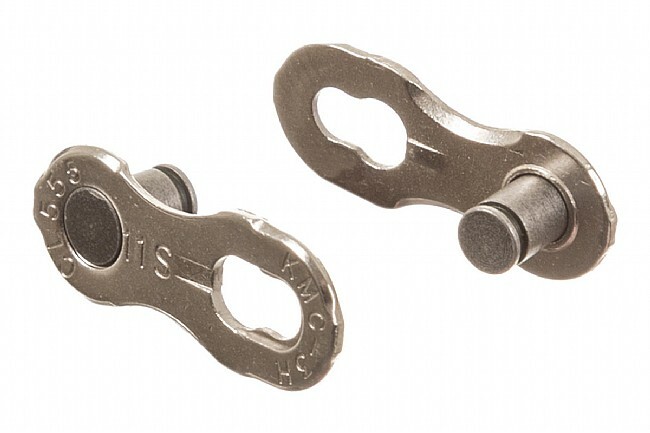 KMC has created the world's first quick link for 11-speed chains. The Missing Link 11 is a convenient, easy-to-use alternative to Campy's coupling pin and doesn't require their expensive chain tool for proper installation. For use with any 11-speed chain. Single use only. 5.5mm wide. I have gone back and forth with pins and chain links, neither one being the perfect solution. The KMC does perform well, but each time I have to remove it, I just end up taking a Dremel Tool and cutting it to get it off because I can't get it off! I like taking my chain off the bike for a thorough cleaning every couple of months and seeing how they don't recommend reusing the Speed Link, I just put another one on. I do not have the installation tool. I figure a chain lasts me about 4 -5 years and over the coarse of the life of a chain, I take it apart 15 times and the overall performance of the chain will be better if I am just doing it at a single point rather than installing 15 pins if different locations on the chain, but have not read anything to substantiate it. KMC missing link better than the funky campy pin. I keep an extra pair in my flat kit. I also continue to use the masterlink for the life of a chain, usually removing around 4 times to clean and wax my chain. I typically run a pair approximately 1500 miles before changing chain and to new link. These are compatible with shimano chains. I've used these chain links for years. I never bothered with the Campagnolo pins. I do have a chain link removal and installation tool in my tool kit. And, although not recommended, I do reuse them, usually for the life of a chain. As a ride leader in a local bike club I carry a few chain links of various widths in my seta bag. If a rider somehow badly snarls a chain we simply remove the kinked link and put in a chain link as a rescue device to get them home. This happens about once a year. With a chain breaker in a multitool and some practice the rescue can be done easily and quickly. This is a great alternative to the insanely overpriced Campy tool. I have about 200 miles on the link so far. There is no noise or shifting problems whatsoever. It went on with an easy squeeze from a set of needle nose pliers. Amazing! much more simple than the campy connection pin. I've had to make in the past two connection points. Used the campy 11 speed pin on one end of the chain and the KMC missing link at another connection point at several links away from the first connection point. Never had a problem. Performed this maneuver on two chains already! Keep things running smoothly on your road, mountain, or commuter bike.